So, I haven’t written a Gastro Graze in a while. We have been trying to cut back on eating out, but the amount of new eateries popping up in Austin hasn’t slowed. 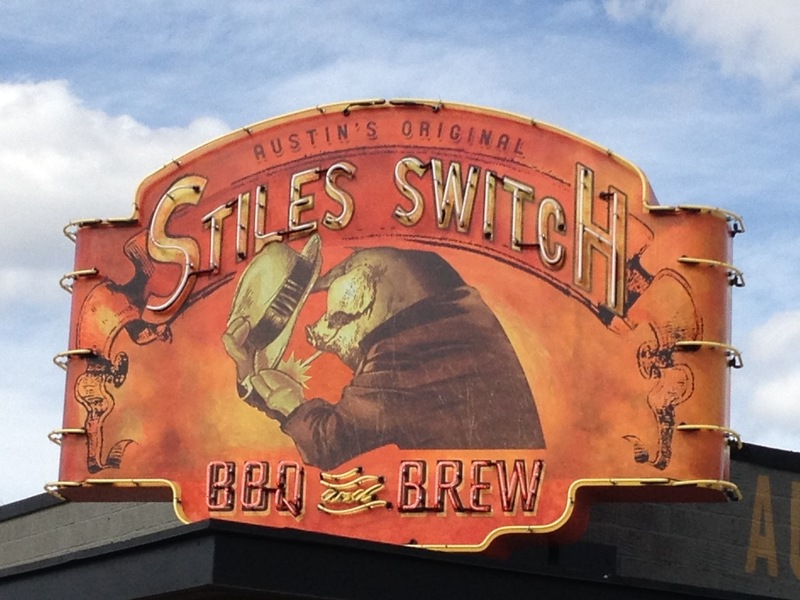 Yesterday Chip and I decided to try Stiles Switch, a new local barbecue joint on North Lamar. Stiles Switch has a nice location with an industrial feel and, best yet, lots of parking. That being said, it was 1:30pm on Saturday…and the place was almost empty. The interior of the restaurant was very clean and well kept, and it has a more established feel than the 10 months it’s been open. The gentlemen behind the counter were very nice, as well. For our lunch, Chip and I decided on BBQ staples: 6 pork ribs, 1/2 pound of brisket, and cole slaw. There wasn’t an option for moist (fatty) or lean on the brisket, and we didn’t notice that they also served sausages until after we’d paid for lunch, so I would go back to try their jalapeño cheddar offering. I generally stay away from chicken at BBQ places, which Stiles does serve, only because of its tendency to be dry. We also got a root beer and an orange soda. The total came to $31, which means they’re a bit pricier than Black’s or Smitty’s out in Lockhart, but that’s the price of not having to drive an hour out of town. Ribs are a staple when gorging myself on smoked meats. A rub can make or break them; I find Cooper’s to be too black peppery though Chip disagrees. Stiles had a decent rub on their ribs, however, that was a good balance of smokey, sweet, salty, with the flavor of pepper coming through without being over-powering. Our lunch order came with a cup of the Stiles sauce which was…interesting. I’m not a big fan of BBQ sauces, but they seemed to be attempting a new spin. Rather than use a base of ketchup in their sauce, it tasted heavily of canned tomato soup. It was odd to say the least, though not all together bad, but most of it remained when Chip and I finished eating. Stiles Switch sells two kinds of cole slaw and we got a small serving of each. I’m generally not a fan of mayonnaise based cole slaws, but theirs was tasty and not heavy. Chip felt it seemed to be a very basic slaw, however, and nothing special. 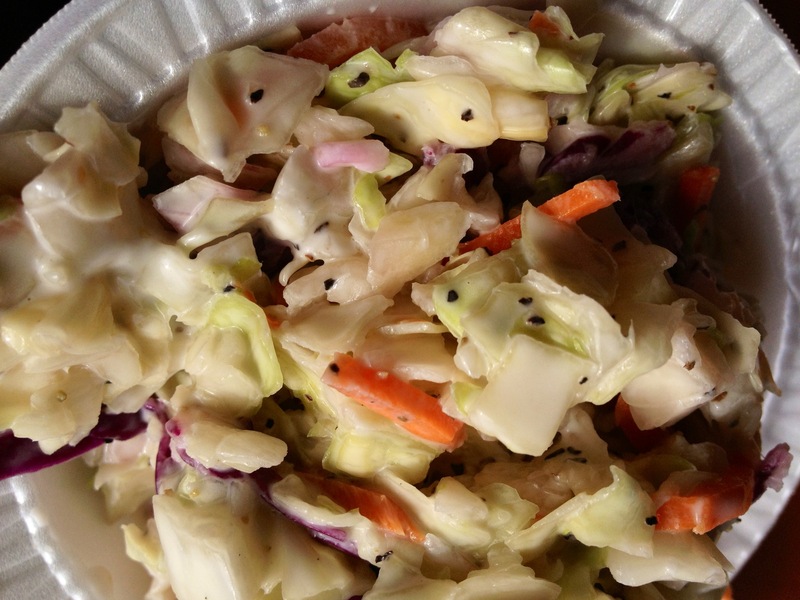 The other slaw they served was a lemon vinaigrette variety, which was flavorful and bright, and a nice change of pace from the usual offering. Stiles also offered potato salad and macaroni & cheese, neither of which Chip or I tried. Now to the brisket. I am picky about my brisket. It should be moist – but not too moist. 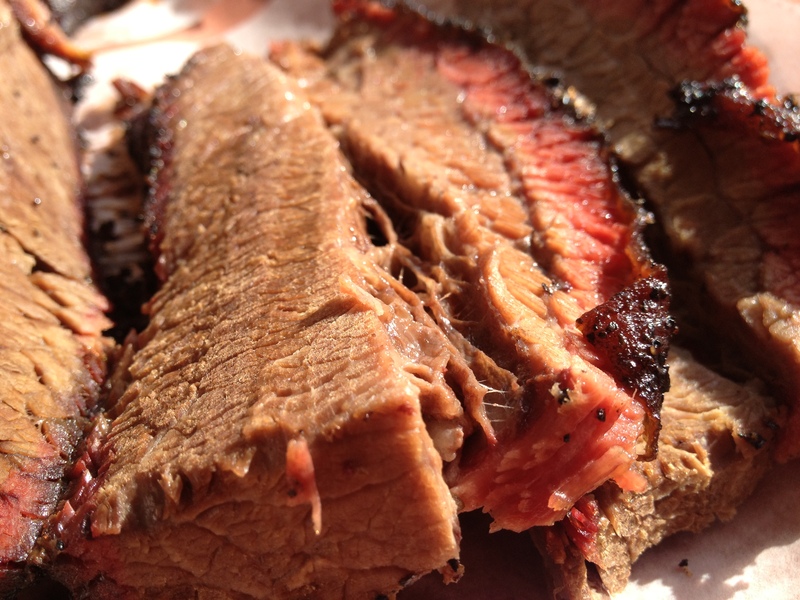 Unfortunately, the brisket we had at Stiles was closer to beef jerky than to juicy, tender brisket found at Iron Works or Franklin’s. 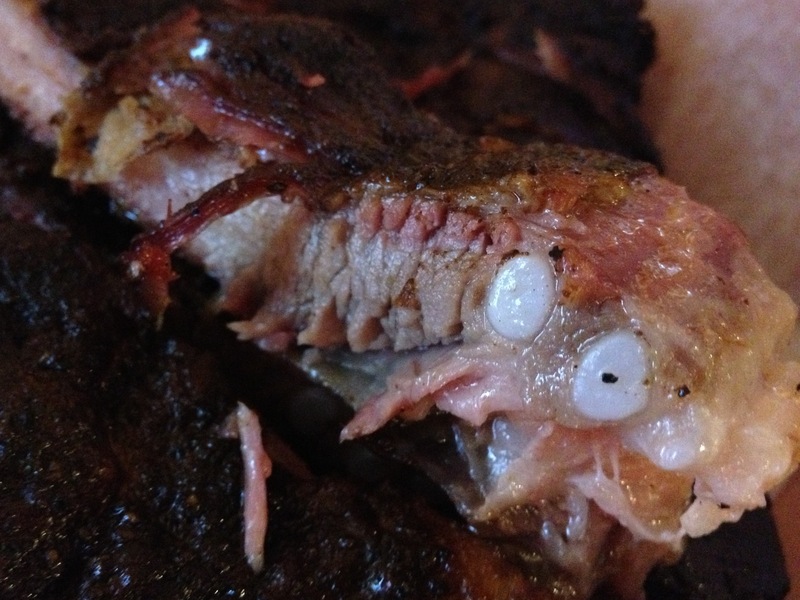 As you can see on the left side of the picture, this brisket is dry. It was also cut very thick, which only served to make its texture all the more unappetizing. Between the two of us, Chip and I only finished one piece of our 1/2 pound of brisket. The bark was tasty, but was ultimately too tough to enjoy. Would I return to Stiles Switch? Yes, because I would like to try the sausage, and maybe even give the brisket a second chance, but it won’t be any time soon. Would I recommend it? Probably not. My issue that barbecue is not cheap, and there’s so much competition near and far in this area, that a restaurant really can’t afford to make less than great. This entry was posted in Entertainment, Gastro Graze, Humor, Pop Culture and tagged austin, barbecue, bbq, blacks, brisket, diet, eatery, food, lockhart, lunch, new, paleo, restaurant, review, ribs, stiles, switch. I can’t imagine “make it taste like canned tomato soup” was a decision anyone would make on purpose. I do like vinegar based coleslaws with BBQ as they serve a practical purpose of cutting the fat. Next time you are up north hit up Rib Kings on Burnet and 183. They have my favorite brisket in town and their pork ribs are most often spot on.